RICHMOND Alvarado Park - Junction of Marin and Park avenues National Register #92000313 Located in the mouth of Wildcat Canyon, Alvarado Park was originally a private park that was owned and operated by local residents from 1909-1923. 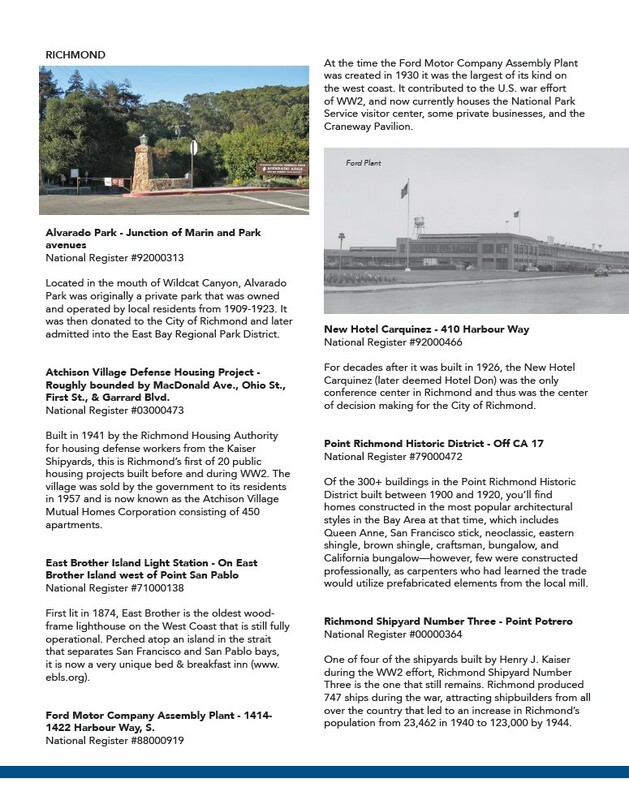 It was then donated to the City of Richmond and later admitted into the East Bay Regional Park District. Atchison Village Defense Housing Project - Roughly bounded by MacDonald Ave., Ohio St., First St., & Garrard Blvd. National Register #03000473 Built in 1941 by the Richmond Housing Authority for housing defense workers from the Kaiser Shipyards, this is Richmond’s first of 20 public housing projects built before and during WW2. The village was sold by the government to its residents in 1957 and is now known as the Atchison Village Mutual Homes Corporation consisting of 450 apartments. East Brother Island Light Station - On East Brother Island west of Point San Pablo National Register #71000138 First lit in 1874, East Brother is the oldest woodframe lighthouse on the West Coast that is still fully operational. Perched atop an island in the strait that separates San Francisco and San Pablo bays, it is now a very unique bed & breakfast inn (www. ebls.org). Ford Motor Company Assembly Plant - 1414- 1422 Harbour Way, S. National Register #88000919 At the time the Ford Motor Company Assembly Plant was created in 1930 it was the largest of its kind on the west coast. It contributed to the U.S. war effort of WW2, and now currently houses the National Park Service visitor center, some private businesses, and the Craneway Pavilion. Ford Plant New Hotel Carquinez - 410 Harbour Way National Register #92000466 For decades after it was built in 1926, the New Hotel Carquinez (later deemed Hotel Don) was the only conference center in Richmond and thus was the center of decision making for the City of Richmond. Point Richmond Historic District - Off CA 17 National Register #79000472 Of the 300+ buildings in the Point Richmond Historic District built between 1900 and 1920, you’ll find homes constructed in the most popular architectural styles in the Bay Area at that time, which includes Queen Anne, San Francisco stick, neoclassic, eastern shingle, brown shingle, craftsman, bungalow, and California bungalow—however, few were constructed professionally, as carpenters who had learned the trade would utilize prefabricated elements from the local mill. Richmond Shipyard Number Three - Point Potrero National Register #00000364 One of four of the shipyards built by Henry J. Kaiser during the WW2 effort, Richmond Shipyard Number Three is the one that still remains. Richmond produced 747 ships during the war, attracting shipbuilders from all over the country that led to an increase in Richmond’s population from 23,462 in 1940 to 123,000 by 1944.